Integrating boxes on the underside of a spacecraft without the use of overhead material handling equipment requires precision positioning and lifting capability of a Flotron Assembly Fixture. The lift mechanism, dual stage slide and tip/tilt/rotate stage on this Cantilevered Precision Alignment Fixture provide six degrees of freedom to accomplish this feat. Finishes and lubricants are compatible in an ISO 14644-1, (Class ISO 7) / FED STD 209E (Class 10,000) clean room spacecraft manufacturing environment. 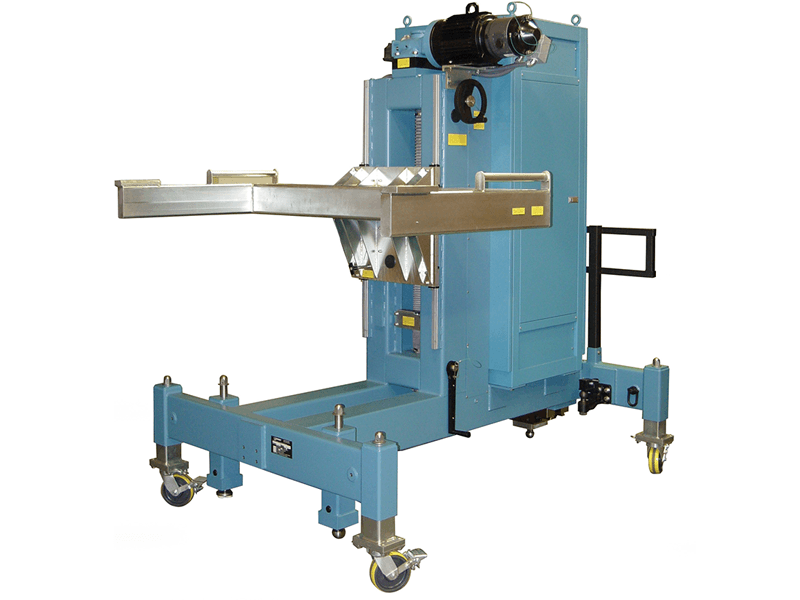 The vertical axis of this RF Testing Fixture / Precision Alignment Fixture is powered by an electromechanical lift system with variable speed drive operating through a self- locking (for safety) ACME screw and a worm-gearbox. A spring-set back-up safety-brake is also used for redundancy to ensure no drift occurs from vibration or other outside loads. 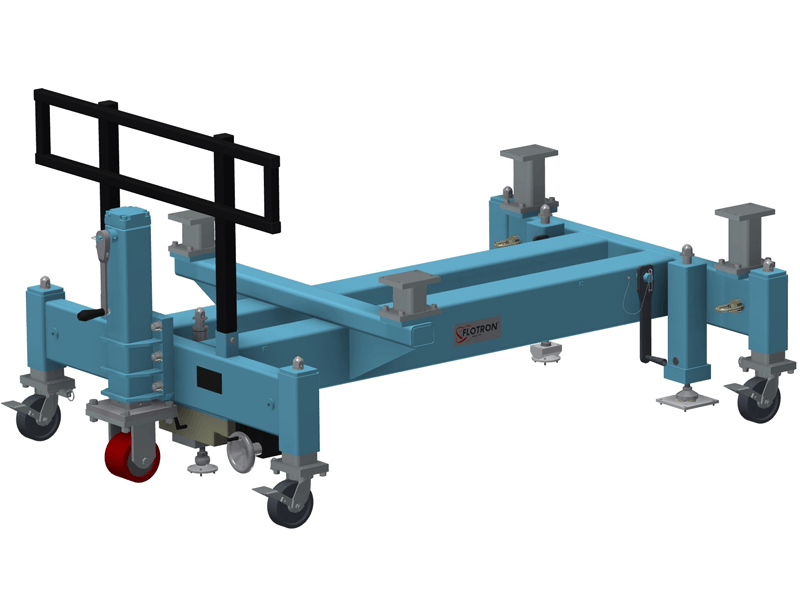 This Aerospace Tool can be lowered via its caster-jacks onto 3 adjustable tooling balls/pads. The precision tooling ball system can rotate the fixture and load around 3 perpendicular axes until the load is accurately aligned according to the customer supplied laser alignment system. At the rear of the fixture is an electronics rack for supporting the customer's electronics test equipment. The payload interface arm was designed considering the customers unique payload geometry without interfering with the test setup. 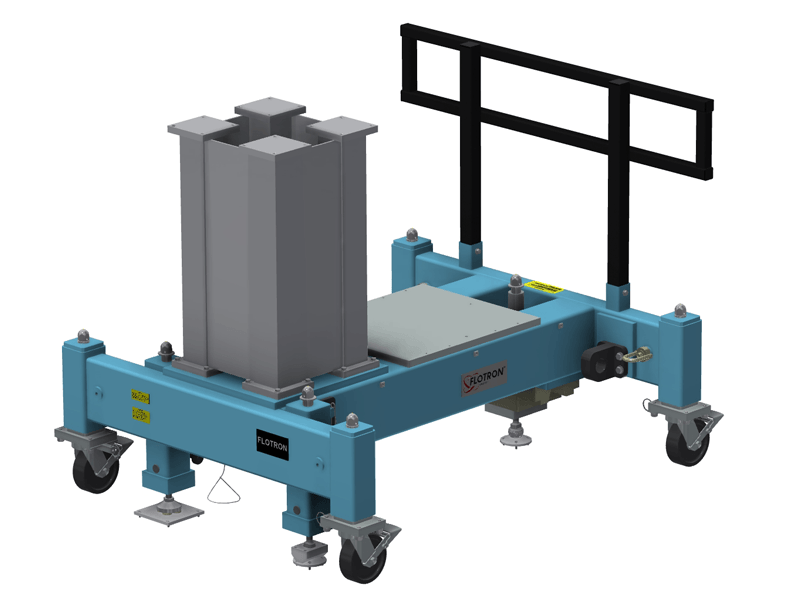 This RF Test Cart / Precision Alignment Fixture base fixture is intended to be used with a customer provided payload interface. A large lift jack at the rear of the unit allows the technician to orient the customer’s payload interface so that it is perpendicular to the floor during payload integration. The caster jacks lower the Aerospace Tool so that a series of three precision alignment tooling features seat in their respective floor mounted receptacles. A precision slide is than translated at the back to pivot this Pointing Fixture (with payload integrated) and align for an RF testing application. 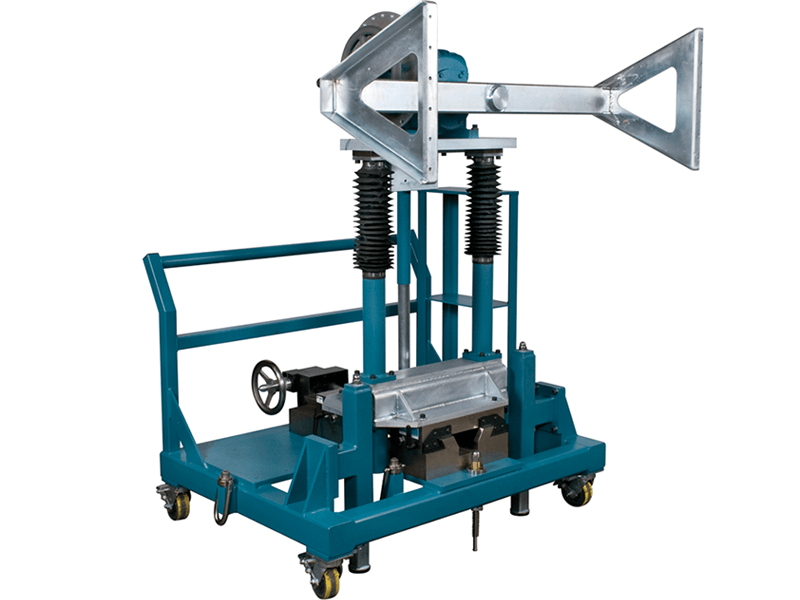 This Precision Alignment Fixture / Cantilevered RF Test Fixture incorporates lifting and horizontal translation features to align a payload while it is mounted to a test plane. The rotation gearbox, lift jacks, and translation cross slide are non-back-driving. Tooling rods mounted to the base of the fixture locate the fixture between angle mounts that are bolted to the floor during docking. The mechanical inputs to the rotation, lift, and translation hardware all have locking features to eliminate undesired operator input. Rotating a large cylindrical payload when interfaces are not available at its ends can in some cases be accomplished with split ring interface hardware. The top two halves of the rings are lifted off with a spreader bar, attached to the payload, and reattached to the bottom two ring halves. The spreader bar is removed, and the cylindrical payload is free to rotate. The Test Fixture is capable of rotating the payload 360 degrees with an angular velocity ranging from 1/10th RPM up to 1 RPM using a UL approved motor and control system via a pendant. A drive shaft drives the base of both rings and four idler wheels on the frames support ring rotation. A tow bar and motorized mover were provided to tow/transport the testing fixture. A leveling jack on the front of the fixture seats in a precision receptacle on the floor for repeatability and the motorized mover can pivot the fixture in an arc around this point. 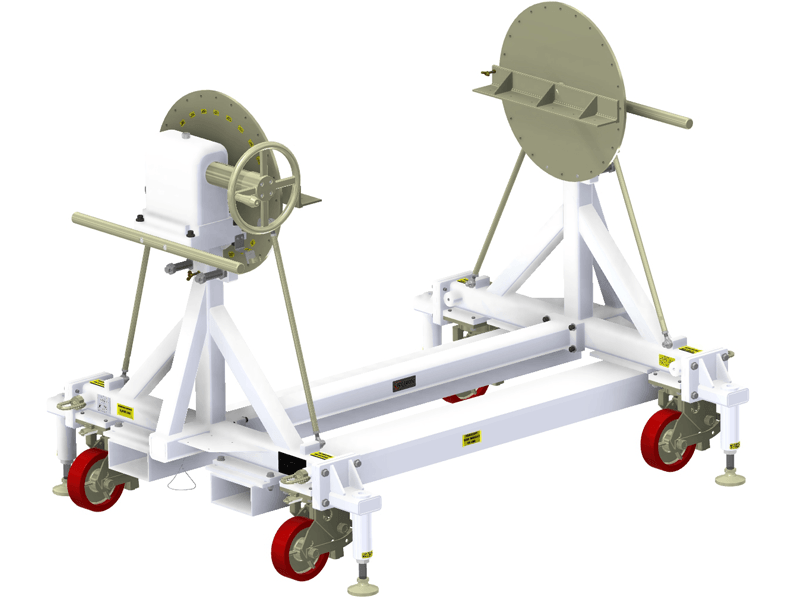 This Spacecraft Optical Test Fixture has a single axis of rotation and a load rating of 600 lbs. 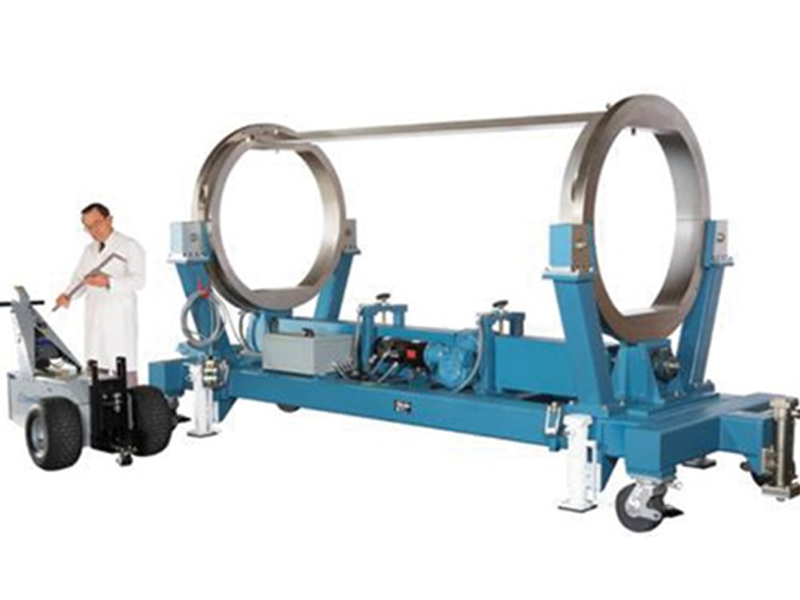 Similar to the Dual Axis Rotate and Precision Alignment Fixture, this Aerospace Tool is designed to support assembly, integration and test operations in addition to optical alignment. Clearance lockout features, including lock rods, index locking screws, removable leveling feet (not shown), ensure that, when a 10 gram load is applied, the resulting angular deflection is less than 5 arc-seconds. Shock absorbing casters offer payload protection during transportation. Removable forklift tubes are constructed from aluminum material. 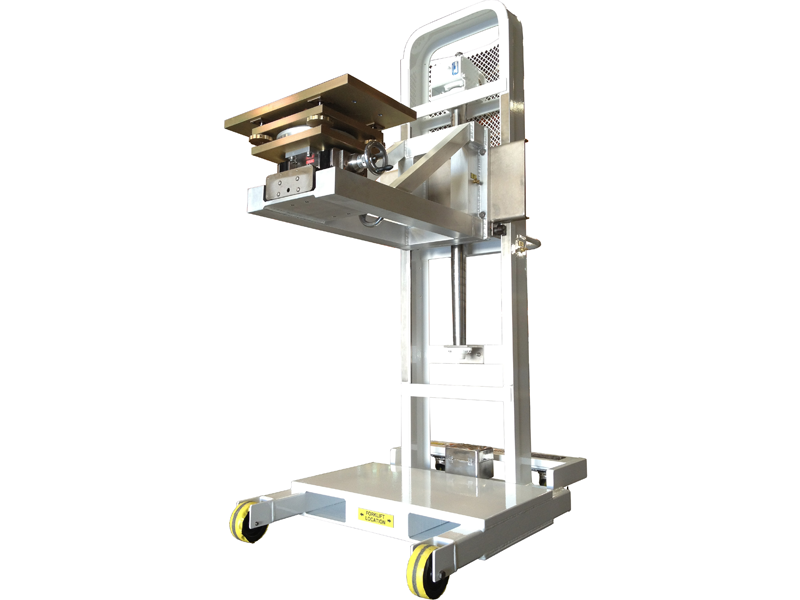 Push bars provide an ergonomic interface for the technician to transport and navigate the Aerospace Tool (with payload integrated) through hallways and over varying terrains. Test fixture capable of supporting and fine positioning of an RF payload during near field testing.